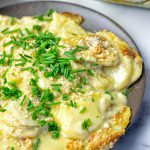 My Garlic Butter Scalloped Potatoes are so incredibly easy and delicious. 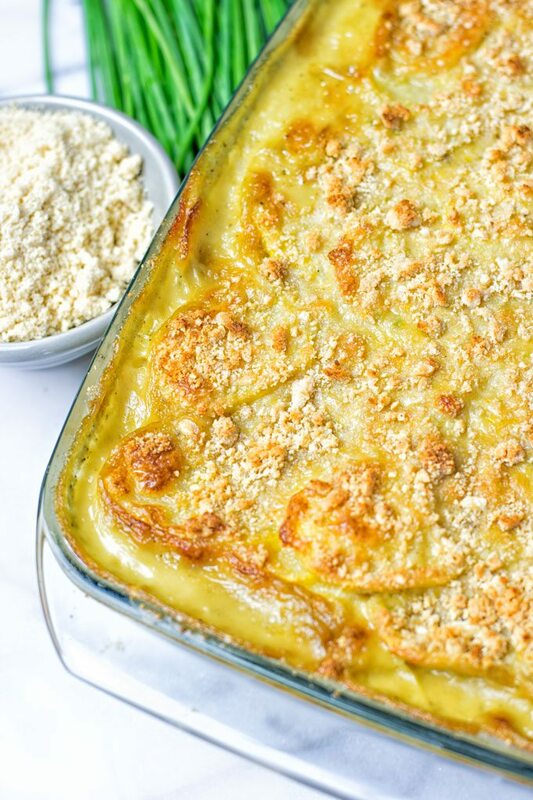 With just 5 ingredients you are ready to enjoy a gluten free and vegan potato recipe that you won’t forget. 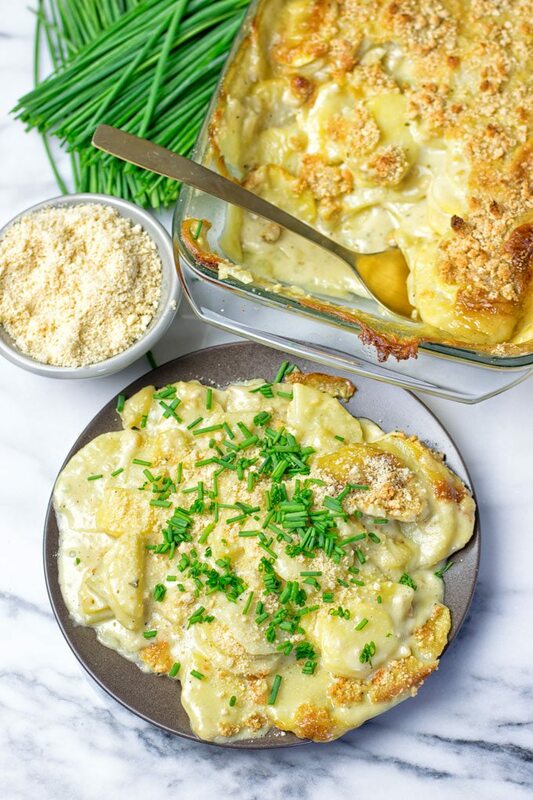 Before vegan days one of my favorite dishes was scalloped potatoes. It was super easy to make so even I could manage to get it done at time when I didn’t know much about cooking. Even without much cooking experience it was not complicated. Of course, it wasn’t vegan or gluten free but made with a lot of cheese, butter, and cream. Now I realized that it was too long since I ate a real scalloped potato dish. High time for me to recreate one of my favorites in a plant based way. It’s always a big challenge to see if I can do this and if it will taste like the the real deal. I promise you: mission accomplished. 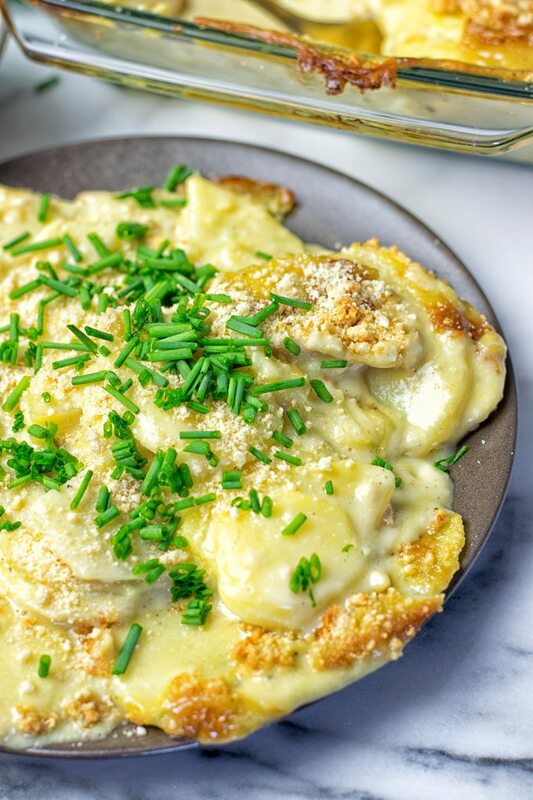 These Garlic Butter Scalloped Potatoes turned out so great, it’s unreal. Better than the classic stuff. I hope you’re ready for one of my favorite recipes before vegan days. 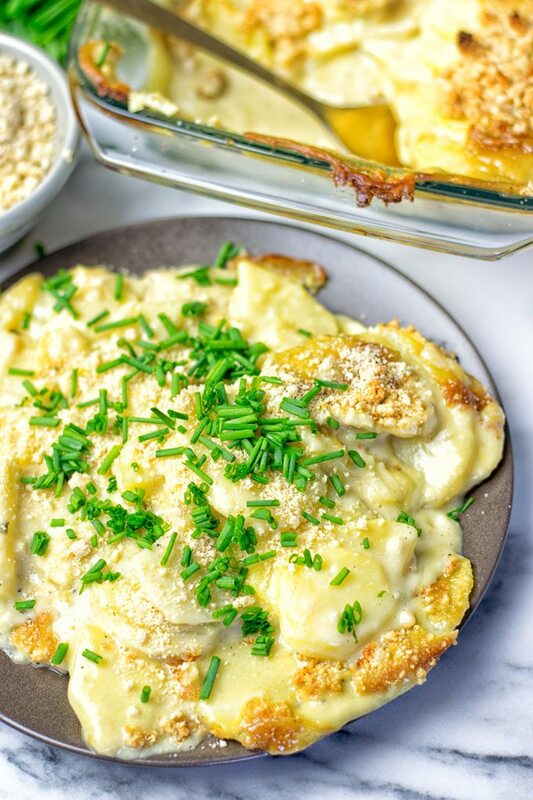 My Garlic Butter Scalloped Potatoes are simple, garlicky, cheesy, creamy, satisfying, drool-worthy, addicting, and amazing alone or to complete every meal. Shall we? Come on bard and let’s do this! Heat a sauce pan and melt the cacao butter. Add garlic to the pan and simmer until golden but be careful not to burn it. Turn the heat off, add oat cream, garlic, vegan Parmesan to that same pot. Season with salt and pepper and mix all well. This way we don’t need an extra bowl. Next fill a casserole dish with the potato slices. Give the sauce on top and mix well. Sprinkle with some vegan Parmesan on top again, covered dish with aluminum foil. Bake for around 1 hour at 400°F. Please note: when you bake this without the aluminum foil cover, the vegan Parmesan on top will likely burnt, we don’t want that. This will be really sad. I tried this recipe without roasting the garlic. It was good but honestly roasting the garlic takes it to another level. So don’t skip this step, it’s worth it and will add so much flavor. As you can see, I don’t use any starch or flour in this recipe, which is always helpful when you want to get a thick sauce. But we don’t need any starch or flour, thanks to the potatoes which are full of it. 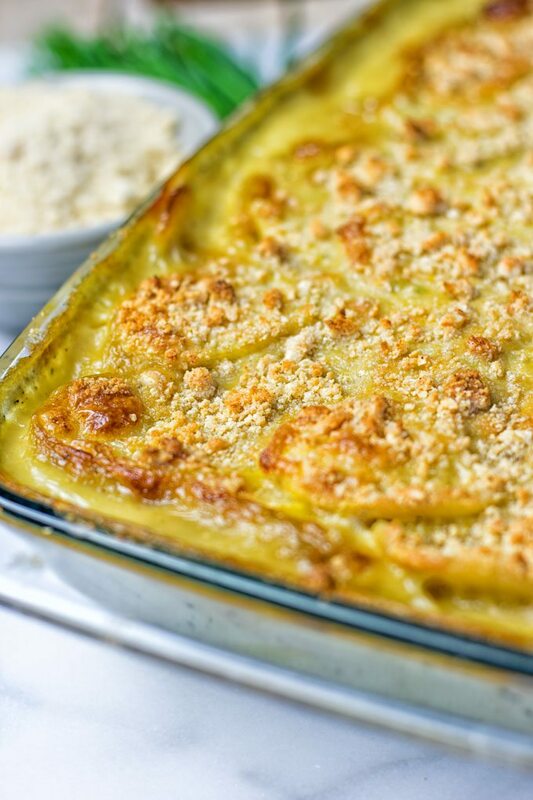 It will naturally thicken when baking without any extras. 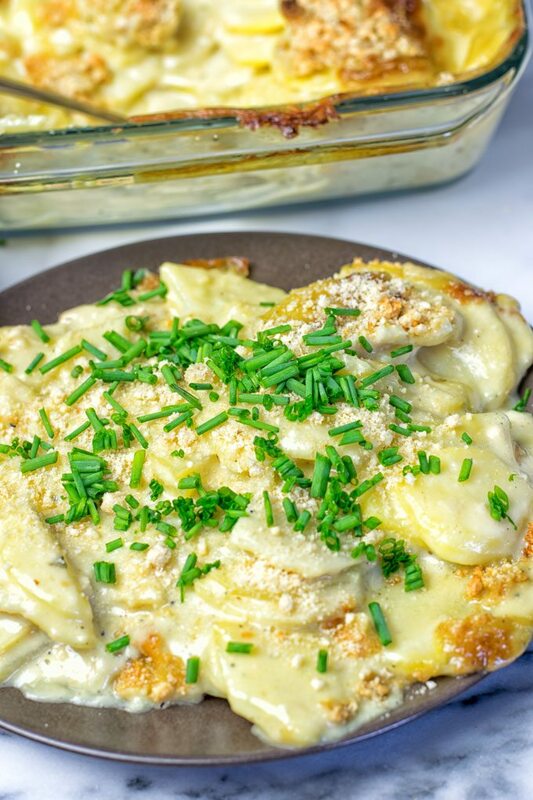 All right if you ever make this and plan to dive right into it, you will recognize a delicious and fantastic smell of creamy garlic. Seriously this is the smell you can’t get enough of. 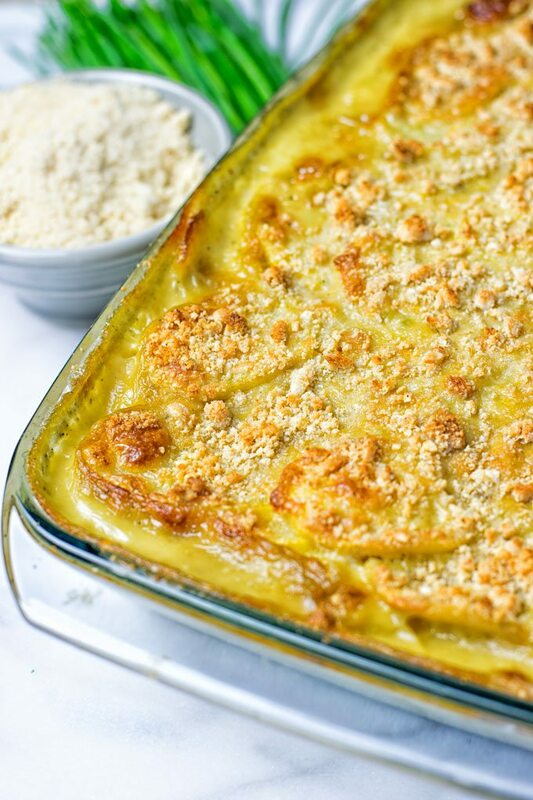 Believe me your mouth will water just while you have this in your oven. It is delicious on it’s own or serve it as a side. For example it will be amazing with my Thai Green Curry Meatballs or the White Bean Meatballs Italian Style for are really filling and complete meal. Garlic is high in nutrients but low in calories. Think of vitamins C and B6, manganese, selenium, and fiber. These little show stars can also lower blood pressure, good for bone health, full of antioxidants. Next on out list is cacao butter: a health booster, amazing for skin health, can reduce inflammation, also high in antioxidants. Nutritional yeast is an amazing source of vitamin B12, which is important for the production of red blood cells. It’s often found in animal sources and with nutritional yeast you can get all the nutrients in a plant based way. Makes it valuable for all vegans and vegetarians. High in protein, too. I know this is the question which we hear all the time: where do we get protein, right? No worries, it’s here! Also high in fiber, which is important to regulate blood sugar levels. Last but not least, we use cashews in the vegan Parmesan. They protect eyes, are also amazing for the skin, high in antioxidants, zinc, magnesium, phosphorus and a fantastic source of phytochemicals, and proteins. Wanna know more? It’s here: “7 Incredible Cashew Nut Benefits: From Heart Health to Gorgeous Hair“. If you give this a try let me know. Serve this and impress your sweetheart, at potlucks, get togethers, or enjoy it just for yourself. You deserve the best so make it now. Tag me on Instagram and Facebook, snap a picture and enjoy. Cheers, friends and happy cooking. Heat a sauce pan and melt the cacao butter. Add garlic to the pan and simmer until golden but be careful not to burn it. Turn the heat off, add oat cream, garlic, vegan Parmesan to that same pot. Season with salt and pepper and mix all well. This way we don’t need an extra bowl. Thank you so much! Glad it was a big hit! How do you make or buy oat cream. I have only heard of coconut cream. Thanks! Hi Sharon! I got mine at a local store, but you can try to get them online. Otherwise any other plain plant based creamer will work. Just make sure there is no sugar or any other sweetener added. Thank you. The recipe sounds so good and people are pinning it off of my Pinterest board . I want to make it. When you say creamer do you mean like a coffee creamer? I’m not clear on that. I keep thinking of canned cream or almond or hemp milk. I will try looking on Amazon. Hi Sharon! You need a plain creamer which is thicker than milk. Make sure it’s without any sweetener which is fine for sweet things but not for savory. If you try this with almond or hemp milk, it will work but you need a bit tapaioca or potato starch for thickening. What is cacao butter? Where can I buy it? Also, would it still be yummy with half as much garlic? Hi Gloria! Cacao butter is the fat pressed out of cacao beans. You can buy it at most healthy stores or online. It will work with half the garlic, but it will taste less flavorful. Can cacao butter be used in savory recipes like this without adding a “cacao-ish” taste? This is so interesting!! Love your recipes, creativity and generosity with recipes…big fan!!! Hi Lisa! Of course! I used it all the time for savory recipes. It creates a real butter flavor. You won’t taste a cacao flavor. Hello! I have a question. You say to add the garlic to cook in the cacao butter, but then you say to mix in garlic after as well. Also, in the description you say to use roasted garlic but that’s not mentioned in the recipe. How much of the 10 cloves should be roasted, and how much used fresh? Thanks, I can’t wait to make this! Hi Diya! You cook all of the garlic cloves in cocoa butter. This will roast the garlic. Hope that helps! Do you also have a video for this? Hi Nij! I don’t have any videos right now. But see what the future holds! Hi !! this recipe tastes great! do you think I can sub the cacao butter with another vegan butter ? I have some problems in finding the cacao butter where I live. thank you so much! Hi Sara! This will work as well! Hi there, I’m hoping to make this at Easter dinner next weekend. Where online do you buy the rice or oat creamer? What brand do you prefer? I’m having a hard time locating it. Thanks! Hi Shawn! You can find the oat and rice creamer online at amazon. I like oatly and isola. Also any other creamer will work for the recipe. Just make sure it’s plain without any sugar.